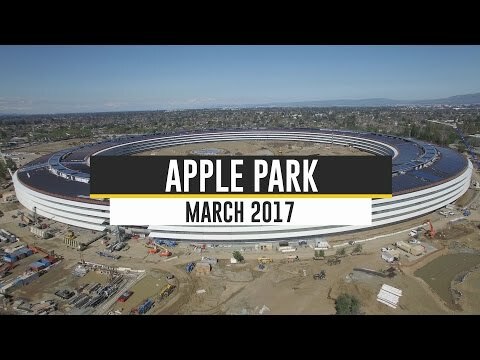 With the move-in date fast approaching, a new video has been published showing the advances that the construction teams have made on the newly christened Apple Park headquarters and Steve Jobs Theater in the last month. The most recent video mostly highlights the naming scheme that Apple has adorned the campus. Overall, the solar panel installation is mostly finished, with the vast arrays on the garage done, and the main building near-complete. Apple's satellite research and development facility structure is complete, and a great deal of progress has been made on other peripheral buildings as well. With the abatement of the rains, landscaping has made great progress, with a copse of drought-resistant trees arrayed in the center of the main building. On Feb. 22, Apple officially named the "spaceship" campus under construction. 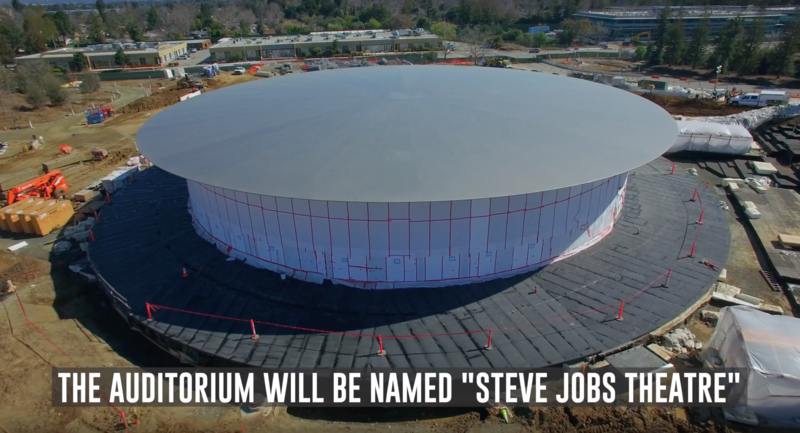 The entire facility is known henceforth as "Apple Park," with the 20-foot tall and 165 foot in diameter glass auditorium called the "Steve Jobs Theater." Much of the Apple Park was conceived by Jobs, who made the project one of his last efforts. One of his last public appearances involved pitching the idea to the Cupertino City Council. An environmentally-friendly design was paramount to Jobs's vision, and Apple's related Phase 2 project adds additional workspace adjacent to the main headquarters, and includes a renewable energy-powered small data center. The employee migration to the new facility will take over six months to complete, and will start in April. A new micro-grid installed on the campus is reportedly capable of delivering 17 megawatts of power from solar alone, and handling about 75 percent of the facility's power requirements. The solar installation is supplemented by Bloom Energy-provided fuel cells, similar to those installed at the North Carolina data center. Just inspiring! Made my day. When will we see an Apple City? The entire city planned by Apple. All of the infrastructure is thought out and iHome linked. Schools emphasize coding and other useful subjects for the future. No city -- the plan is for the new HQ to blast off into space once the warp cores are completed and this planet's usefulness is at an end. iPhone was just a means to that end. I hope they don't go without me! The next video installment in this series will feature a brief series of shots of the completed facility followed by the quadrocopter plummeting to the ground after being hit with a microwave gun by Apple security. ...with a copse of drought-resistant trees arrayed in the center of the main building. The trees have been planted in a grid, not very natural, they should be scattered about. 1) Matthew did an outstanding job. Any idea what program he would use to edit the video and the text overlays? 2) Based on still incomplete look of the Steve Jobs Theater and the grounds between it and the parking garages, I'm guessing that a March/April iPad even will not be held at this facility. Oh well, it'll happen soon enough. Apple already stated that the auditorium would be done later this year. Clearly the venue isn't finished and there is zero landscaping around the lobby. This would be a horrible place to hold a March/April press event, with mounds of dirt. Clearly the venue isn't finished and there is zero landscaping around the lobby. This would be a horrible place to hold a March/April press event, with mounds of dirt. Hence, my comment. Thanks for the info that Apple has officially stated when the auditorium would be ready. I hadn't seen that. The grid is by design since the area used to be orchards in a time before tech. I'm curious if they actually planted fruit tree varietals that used to grow there. This is a seriously impressive campus. As with all things Apple, the company's attention to detail and precision when it comes to landscaping the campus is meticulous. And expensive. There are currently 4,506 trees on the site that Apple bought from Hewlett-Packard. Some of those will be boxed up and preserved for re-planting, probably stored elsewhere on the site. In addition, the company intends to increase the number of trees to 7,000. "In excess of 6,000 trees will be planted on the site, including fruit trees, in addition to retaining approximately 1,000 trees currently on the site," Apple says in its proposal. As part of the new development, the vast majority of the perimeter tress will be retained. Many of the interior trees will eventually moved to the perimeter. In general, the increase in trees is designed to create a kind of canopy effect over much of the campus. Among the types of trees will be Oaks Savannah, Oaks Woodland, and fruit trees including apricot, apple plum, cherry and persimmon. It was in the press release. Seems like I can't get recent 4K YouTube videos to be viewed. Was working great in the past. I don't want to jump through hoops to view 4K video from YouTube. This one I can only view at 1440 resolution. I think all of us here regardless of our political beliefs should contact YouTube to change their video encoding. Lets get united on this cause. What happened to the old barn? Good question. I haven't noticed a barn within of the drone flyovers. I wasn't looking for it, but I'd think it would stand out. I seem to recall reading that it would be used to store landscaping and sporting equipment, so perhaps it's over by the fitness center. edit: This plan is from Feb 2012, and I'm skeptical that the barn would be placed that close to the fitness center, but it's only thing that stands out. Maybe it's not even on the Campus proper. Very nice move by Apple, it's little known that Nikola Tesla had had some significant revellations during his stay in nature, in woods actually, as well as Steve Jobs used to emphasise the benefits from listening nature's silence, from which can be learnt a lot, pretty much as successful sportsman like Novak Djokovic draws stregth from for his matches. Hopefully Apple will encourage its employees to use some of their breaks amidst trees. Bravo Apple !